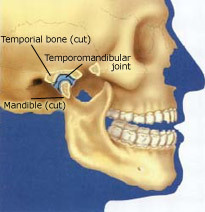 The term "TMJ" is the abbreviation for temporomandibular joint. 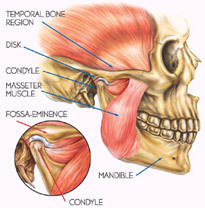 The temporomandibular joint is, in essence, the joint of the skull at which the lower jaw (mandible) hinges from the bone on the side of the skull (temporal bone). Hence, the term temporomandibular joint (TMJ). Disorders associated with the temporomandibular joint are also commonly referred to as TMD (temporomandibular disorders). Most patients, nurses, dentists and physicians use the terminology TMJ more often then TMD but they are really one in the same. 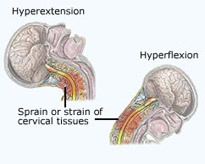 Each and every patient suffering with a TMJ disorder will present with their own unique set of symptoms. Symptoms and conditions will vary greatly from patient to patient as it pertains to which symptoms are present, severity of symptoms, frequency of symptoms and whether or not those symptoms might affect the right side of the jaw and face, left side or both sides. Those individuals suffering with temporomandibular joint disorders may find changing severity in symptoms from day to day, week to week or even month to month. TMJ symptoms can be affected by a variety of different changing environmental factors including stress, hormones, barometric pressure and weather, diet, sleep posture, or even oral habits such as ice chewing, pencil biting, gum chewing, etc. Although TMJ disorder may affect patients of any age, male or female, we recognize that approximately two out of every three patients diagnosed with TMJ Dysfunction are females between the ages of sixteen and forty-six. It seems to be, therefore, a condition affecting women of the child bearing years primarily. Experts, like Dr. Moodt, recognize that the causes or risk factors for TMJ disorder are many and variable. Most commonly TMJ disorders develop primarily as a result of stress and anxiety induced parafunctional habits such as clenching or grinding (bruxing) the teeth. At a subconscious level many individuals will clench teeth during the day or clench/grind at night while sleeping as an involuntary stress release mechanism. Some TMJ disorders develop as a direct result of obvious trauma. Airbag deployment during a motor vehicle accident, a sports injury, punch, fall or other accident may traumatize the delicate structures of the temporomandibular joints resulting in joint inflammation, muscle pain and even disc hyper-mobility (clicking). In those instances a patient may be able to specifically pinpoint a time, date and event that occurred triggering the onset of TMJ symptoms. The majority of patients, however, may not be able to specifically identify a cause or time when symptoms developed. Many patients will remember that clicking sounds or jaw and facial pain began initially as mild and intermittent. With passing time the frequency and severity of jaw and facial pain, headaches and clicking sounds may escalate. The nervous system, musculoskeletal system and circulatory system of the head and neck region are complex. Although temporomandibular joint disorders are fairly common we cannot dismiss the fact that examination and consultation may lead us in another direction. Other jaw and facial pain disorders that may be confused with TMJ Dysfunction and create symptoms similar to those created by TMJ Dysfunction include occipital neuralgia, trigeminal neuralgia, temporal tendonitis, Temporal Arteritis, Ernest Syndrome, atypical facial pain, Osteonecrosis, and Fibromyalgia. Thorough and accurate diagnosis can only be achieved when a patient is evaluated by a skilled and experienced specialist in the field of TMJ disorder. Dr. Moodt and his staff await your visit to provide that service. Each patient should also be reminded that in some instances more then one physical condition may co-exist. For example, a patient might have an infected tooth and TMJ disorder at the same time. A patient may present with TMJ disorder along with sinus infection. Presenting with two or even more distinct conditions simultaneously will occur from time to time. Dr. Moodt will differentiate those problems and concerns. Each and every condition may not be treated by Dr. Moodt. He will make a referral to experts specializing in those conditions to allow for complete and comprehensive care.